When a druid turns away from the land, the land turns away from her. Some ex-druids make peace with this change; others seek to restore the bond. A few, however, actually embrace their disconnection from nature and become forces of destruction. These few, called blighters, bring desolation wherever they tread. Blighters are usually ex druids, however any casting class can fall into the path of blighters. With enough hunger for power and control they are able to draw the energy for their magics from the land itself. A blighter's magic strips life from the land around her to power her spells. A swath of desolation typically mark a blighter’s presence. Most blighters are nomadic loners constantly in search of new lands to fuel their magic. Blighters have no concern for the destruction they reek, instead they are ever propelled by the need for more power and new lands to fuel their magic. An area leeched of life by a Blighter may require decades (or centuries) before it is able to support life again. The radius of the blight is 5 feet per spell level; a 0-level spell blights a single 5-ft. square occupied by the caster. Creatures other than the blighter caught within the defiling radius at the time of casting experience sharp pain and are sickened (–2 penalty on all attack rolls, weapon damage rolls, saving throws, skill checks, and ability checks) for one round. Creatures of the plant type are particularly harmed by defiling magic, and suffer an additional 2 points of damage per level of the spell slot expended to cast the spell. For this purpose a 0-level spell inflicts 1 point of damage. Depending upon the amount of plant life in a defiled area, a blighter’s spells may be more or less effective. This is represented by either a bonus or penalty to spell save DCs and effective caster levels, as shown below. Corrupted (Su): A blighter’s magic is corrupted by defiling magic, which manifests itself visibly in her spellcasting. Any wounds healed by the blighter leave ugly, jagged scars that are not smoothed by other healing effects. Elemental effects created by a blighter seem uncontrolled and disturbing; water effects are shot through with small streaks or pools of blood, earth effects display small bits of skeletal remains, fire effects flicker with tortured faces, and air effects whisper disturbingly or howl like a tortured creatures. Any animal summoned by a blighter is an undead creature (add the “Skeletal” template to the summoned creature). In addition, animals in a 1-mile radius of a blighter grow increasingly violent and feral; dogs and cats will become hostile and violent towards their owners, farm animals will trample and devour nearby humanoids, and travelers will be ripped apart by swarms of maddened squirrels. Any druids within this radius instantly learn that a blighter is in the area (but not her exact location). Continual use of defiling magic has a corrupting effect upon defilers, who are slowly driven insane by their magic. Any time a character casts a spell using defiling magic, she must attempt a Will save (DC 10 + spell level) or increase her depravity score by 1. See the Taint rules for more information on depravity. Vermin Empathy (Su): A blighter can improve the attitude of vermin as a normal druid can with animals. Vermin have a starting attitude of unfriendly. 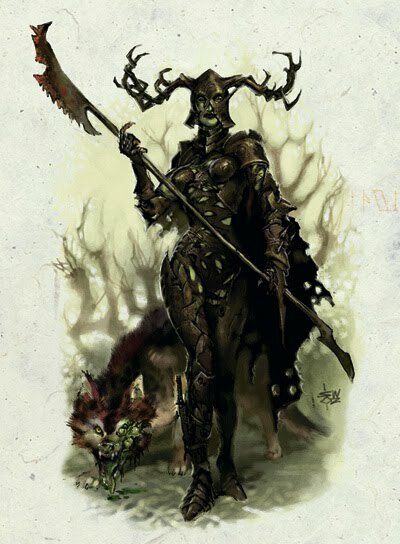 The blighter can also improve the attitude of animals and mindless undead creatures that were formerly animals, but she takes a –4 penalty on the check unless the animal or undead has a disease special attack. Aura of Decay (Su): you can emit a 30-foot aura of decay as a standard action. Living creatures in this aura (except you) take 1d6 points of damage per round as their flesh rots. They also take a cumulative –1 penalty to Strength each round they remain in the aura. Once outside the aura, the penalty fades at the rate of –1 per round, but it begins building again if they reenter the aura. Plant creatures take 2d6 points of damage per round. You can use this ability for a number of rounds per day equal to your cleric level. These rounds do not need to be consecutive. 0 Level Spells: inflict minor wounds, touch of fatigue. 1st Level Spells: bane, burning hands, doom, inflict light wounds, ray of enfeeblement. Deforestation (Sp): A blighter can kill all nonsentient plant life within a radius of 20 feet per blighter level as a full-round action once per day. If a potentially affected plant is under the control of another (such as a druid’s liveoak or a dryad’s home tree), the controller can make a Fortitude save (DC 10 + blighter level + blighter’s Wis modifier) to keep it alive. Plants with an Intelligence score must can also make a Fortitude save with the same DC. Affected plants immediately turn brown and wither. Within minutes, all plant life in the affected area is dead and decayed. Spells that summon or affect plants, such as Wall of Thorns or Plant Growth do not work in a blighted area. Once an area has been blighted, nothing will grow there. Only a spell such as Hallow, Limited Wish, Miracle, or Wish followed by reseeding can restore a blighted area. Deforestation enables a blighter to cast her daily allotment of spells. This ability works in any terrain, but deforesting a sandy desert, ice floe, or other environment with only sparse vegetation does not empower the character to cast spells. blighter can unleash a scorching burst of greenfire once per day. This effect deals 1d6 points of fire/acid damage in a 30 foot radius centered on the bligher. A Reflex save with a DC of 10 + blighter’s HD + blighter’s Wis modifier halved the damage. the blightfire does 1d6 damage / 2HD to a maximum of 10d6 at 20th level. A blighter can use blightfire a number of times per equal to 3 plus her Wisdom modifier. functions like a speak with dead spell, except that it affects only corpses of animal creatures. wounds, produce flame, warp wood. 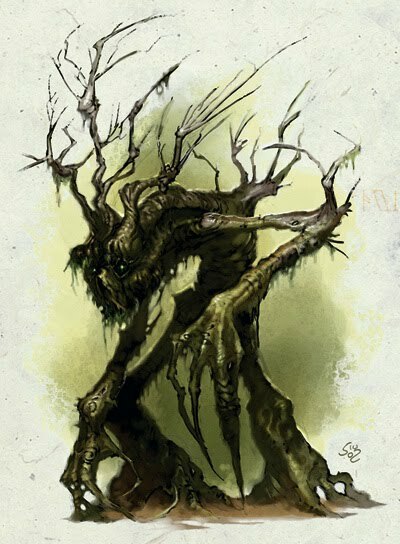 Blight Shape (Sp): the blighter regains a version of her wild shape ability. This functions as a druid’s wild shape ability, except that the blighter May add the Skeletal, Horrid/Acid, or Poisonous template to the form she chooses to transform into. – Type changes to Undead. – Natural armor bonus is +1 (Small), +2 (Medium or Large), or +3 (Huge). – +2 Dexterity, no Constitution score. – Immunity to cold, Damage reduction 5/bludgeoning. touch spell once per day. She gains one extra use per day of this ability for every two additional blighter levels she acquires. must succeed at a Fortitude save with a DC of 10 + 1/2 the blighter’s level + the blighter’s Wisdom modifier or become sickened for 1 round. A creature of the animal, fey, or plant type that fails its save is nauseated for 1 round and sickened for 1 minute thereafter. If the creature makes its save, it is immune to this effect for 24 hours, as are creatures immune to disease. supernatural diseases. She also becomes immune to effects that would cause her to become sickened or nauseated. Efficient Raze (Su): the blighter becomes able to draw more power from the plant life in the surrounding area. Whenever she uses magic, she treats the surrounding area as if it were one type better than it actually is. If she is in an abundant terrain, she gains an additional +1 bonus to her spell save DCs and to her effective caster level. If there is no plant life in the area, though, she remains unable to cast spells. At 8HD, the blighter gains the ability to treat her current terrain as if it were two types better than it actually is. This grants her an additional +1 bonus to her spell save DCs and to her effective caster level in fertile terrains, or an additional +2 bonus in abundant terrains. 3rd Level Spells: contagion, deeper darkness, desecrate, diminish plants, dispel magic, inflict serious wounds, poison, stinking cloud, vampiric touch. Plaguebearer (Su):any creature that strikes a blighter with a touch attack, unarmed strike, or natural weapon must succeed at a Fortitude save with a DC of 10 + 1/2 the blighter’s level + the blighter’s Wisdom modifier or contract a disease, as the contagion spell. If the creature makes its save, it is immune to this effect for 24 hours. 4th Level Spells: animate dead, antiplant shell, blight, death ward, flame strike, inflict critical wounds, languor*, rusting grasp, transmute mud to rock, transmute rock to mud, unhallow, wall of fire. Plague (Su): a blighter can spread disease over a large area. This ability functions like the contagious touch ability, except that no attack roll is required and it affects all targets the blighter designates within a 30-foot radius. Plague is usable once per day. 5th Level Spells: antilife shell, contagious touch*, create undead, forbiddance, repel wood, waves of fatigue. 7th Level Spells: control undead, earthquake, firestorm, repel metal or stone, repulsion. 8th Level Spells: horrid wilting, mind blank, shambler, waves of exhaustion. As a swift action, you can spit a gout of life-stealing venom onto a weapon you are wielding. The poison lasts for 1 minute or until you make an attack that injures a foe with that weapon. Life-Stealing Venom: Injury; save Fort DC 10 + 1/2 your cleric level + your Wisdom modifier; frequency 1/round for 3 rounds; effect 1 Con damage; cure 1 save. You can use the venomous saliva ability a number of times per day equal to 3 + HD. An enigmatic, feared, and utterly evil. Even from his eternal prison, Tharizdun continues to influence the world through his cultists. He whispers to his faithful in the darkness, promising them great rewards for their dedication. They will be the last ones remaining after he cleanses the world of the stink and filth that currently inhabits it. The world is flawed and it is his job to undo all that has been created. He will wipe away the fear, the pain, and the ugliness, but likewise, he will wipe away hope, joy, and glory. Come and meet those who would destroy all that currently exists. Look upon their horrific creations, and discover the tools they will one day use to destroy everything in existence. The cultists of Tharizdun find themselves drawn to the banished god when they have been beaten by the uncaring forces within civilization. They often have enough negative experiences with humanity in general that they decide that the world is fundamentally flawed. They furthermore decide that if they cannot obtain the power they need, then the force of Tharizdun will assist them. The cult of Tharizdun has committed itself to the destruction of all things, but they welcome potential cultists with open arms, pretending to care about the injustices that they have been victimized by, and promising that when Tharizdun reduces the world to smoking ruins, his followers will be rewarded with all the ability to recreate a balanced world. Many Tharizdun cultists briefly follow the druidic path just long enough to learn how to despoil nature. The cultists claim that Tharizdun, and not nature itself, empowers their druidic spells and abilities. Magic items are a central focus of the cult of Tharizdun. Because Tharizdun is locked away in a plane from which he cannot escape, his connection to his followers is not as strong as that of most other gods. His followers can cast some spells, but only if they are in contact with an object or site imbued with some of Tharizdun's power. Portions of destroyed artifacts that were crafted in his name before his imprisonment are frequently worked into magic items to fulfill this requirement. The cult goes to great lengths to recover any remaining portions of these items by devoting months, if not years, scouring moldering texts to learn the history of their god's lost items of power. Remnants of once-mighty magic still possess an ember of their former power, and many consider them the most important direct link between followers and deity. The magic items belonging to the cult include newly forged items as well as some items so old that they date back to the time when Tharizdun walked freely among the planes. The older the items are, the more powerful they tend to be, provided that they remain intact. Numerous wondrous items, magic weapons, armor, and rods have been passed down within the cult for generations, and all of them are identifiable by the symbol of the vortex etched into them. The church commonly crafts the following item for its followers. Net of Despair: This net is crafted from the silk of a drider. The silk is harvested, woven, and then blackened by infusing charred bone powder in with the fibers. The net absorbs light and has a visible aura of darkness. It continuously radiates darkness in a 20-foot radius as the darkness spell. A creature caught within the net for 3 uninterrupted rounds suffers accelerated deterioration. Starting on the third round of entanglement, the entangled creature gains one negative level in addition to ability damage. The creature continues to take ability damage and negative levels each round the creature remains entangled. A creature that escapes the net is fatigued for a number of rounds equal to the number of ability points drained. A creature that survives entanglement in the net can heal ability damage and recover negative levels from the net in the normal manner. The save DC to remove a negative level is 15. In the hands of a nonevil PC, this functions as a normal masterwork net. Moderate necromancy; CL 10th; Craft Magic Arms and Armor, darkness,enervation, ray of exhaustion; cleric must worship Tharizdun; Price 150,000 gp. Encountered within the strongholds of Tharizdun's followers are elhoriads, which serve as an undead force for the cultists. Elhoriads serve as one of the cult's secret weapons against those who seek to destroy them. To preserve the element of surprise, the cult keeps a tight rein on these creatures. Elhoriads are not allowed to wander, and they are not sent to mindlessly terrorize the surrounding countryside. The cult uses them for protection and for attack whenever they move against a selected target. The cultists remain near them in battle, and they ensure that all elhoriads either return with them to their temple or are utterly destroyed. They fear that one of these creatures will fall into the hands of their enemies, allowing their foes to better prepare the next time they encounter the undead creatures. Its eyes are such a deep shade of inky black that they stand out against their ebony remains.The cult of Tharizdun created the elhoriads to act as guardians. The cult researched the various methods of undead creation for several years and even went so far as to recruit accomplished necromancers into their ranks to unlock the secrets that would allow them to manipulate the various forms of undead. Cultists produced elhoriads by taking the base tatzlwyrm and infusing them with the very power of entropy channeled from unearthed remnants of Tharizdun's once-mighty artifacts. This grants these creatures their above average intelligence and their deadly entropic touch ability. Elhoriads are intelligent creatures, but they derive their power from Tharizdun, so they remain fiercely loyal to him and his followers. Elhoriads are the foot soldiers whenever the cult takes action against the outside world. Within their hidden temples, they serve as guards who protect the clergy in the event that their sanctuary is attacked. Elhoriads are used primarily for melee combat. Their job is to weaken opponents before their foes can reach the cultists whom they protect. use their claw attacks to deliver their entropic touch, which quickly weakens their opponents. Entropic Touch (Su): An elhoriad's touch disrupts most living tissue. Whenever an elhoriad successfully strikes an aberration, animal, dragon, fey, giant, humanoid, magical beast, monstrous humanoid, outsider, plant, or vermin with a claw attack, the creature struck must make a Fortitude save (DC 13) or take 1d4 points of permanent Constitution drain and 1d4 points of permanent Strength drain. The save DC is Charisma based. Undead Traits: An elhoriad is immune to mind-affecting effects, poison, sleep effects, paralysis, stunning, disease, death effects, and any effect that requires a Fortitude save unless it also works on objects or is harmless. It is not subject to critical hits, nonlethal damage, ability damage to its physical ability scores, ability drain, energy drain, fatigue, exhaustion, or death from massive damage. It cannot be raised, and resurrection works only if it is willing. The high priests of the god of entropy are known in many temples as the Witnesses of Tharizdun. They oversee the operations of the temples, ensure that their actions remain secret, and lead the faithful in the dark ceremonies, which they believe brings their god closer to freedom. They are dark souls who, unlike those at lower levels of the organization, understand that if Tharizdun breaks free of his prison he will destroy everything in existence, not just the society that may have oppressed them earlier in life. Witnesses of Tharizdun rise to the top of their clergy due to certain common personality traits that ultimately allow them to recruit and lead others within the cult. Though they don't all fit the following description, most have many, if not all of these traits. They possess a superficial charm that attracts people toward them rather than the message that they promote. They come across as soothing and reassuring, despite their utter contempt for their subordinates. Their own emotions run shallow, and they cannot experience love, shame, or guilt. They are highly egotistical with a grandiose sense of self, believing that they are entitled to the finest things life has to offer. Before joining the cult, these individuals commonly have been bandits or societal leeches, living off their own misdeeds or the charity of others. They often wander from place to place, reinventing themselves as the situation demands until they find a welcoming harbor in the cult of Tharizdun, which relies upon all of these traits to promote itself. Many of the witnesses of Tharizdun are truly insane. Their motives are not clearly understood by their peers or sometimes even by themselves. Some fail to fully comprehend what it is that their god wishes to do. They are hateful, malicious individuals, but they have also found inner fulfillment with their deity and his baleful designs. To them, life is neither sacred, nor valuable unless it serves to promote their own agenda. Followers beneath them are to be lied to and deluded until their lives have become so intertwined with the religion that they can no longer extricate themselves from the organization.